Jennifer Slattery is here letting us in on some tips for writing challenging fiction. 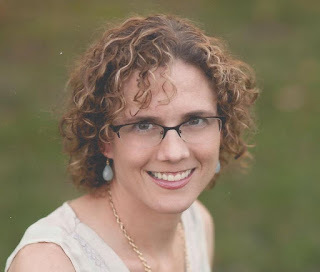 Jennifer Slattery writes soul-stirring fiction for New Hope Publishers, a publishing house passionate about bringing God’s healing grace and truth to the hopeless. She also writes for Crosswalk.com, Internet Café Devotions, and the group blog, Faith-filled Friends. When not writing, Jennifer loves going on mall dates with her teenage daughter and coffee dates with her handsome railroader husband. I was completely blindsided and leveled, for some time to come. In fact, I’m not sure the ache God started years ago has ever left. That ache of knowing, really knowing, and feeling completely and utterly inept. More than that, of wrestling with what God might be calling me to do, and yet, erecting barriers to obedience before the prayer concludes. Double-minded. Partially surrendered. Angered by the injustice of it all yet paralyzed by fear, selfishness, and uncertainty. Some problems seem just too big to tackle, and yet, God—the infinite, all-powerful, all-knowing, sovereign God, has a plan. If we’d but tune our ears and step out in obedience, to whatever He calls us to do. For some that means opening our home to broken children. For others that may mean acting like a support for friends who’ve answered the call to foster. The opportunities to help are endless. And the need, urgent. There are so many reasons we can say now, but there’s a huge and pressing reason to say yes. Kraigen stood in the doorway holding a large garbage bag that wasn’t even half full despite the fact that it carried absolutely everything he owned. Clenching his jaw, he braced himself for the worst. Based on the sappy faces and wide, almost teary eyes that stared back at him, this was gonna be one long night. He pretended to listen to the high-pitched chirping that pricked his ears, but in reality, his mind was a million miles, and neighborhoods, away. He knew the drill. They were happy to have him, wanted him to feel at home, yah-da, yah-dah, yah-dah. He’d heard all that before. And he’d pretend to buy it, for now. Until they shipped him off somewhere else. Because they always did. This was his third home this year, the tenth home since those high-and-mighties down at children’s services shipped him off five years ago when they found his mother passed out on the living room floor, a used heroine needle dangling from her limp hand. “Can I take your…um…bag for you?” A lady with a way too big smile and mascara caked eye-lashes asked, reaching for Kraigen’s things. He jerked away instinctively and clutched the smooth plastic to his chest. The woman’s eyes went wide. The man beside her, tall with a thick shaggy beard and thick glasses, started to move forward. When Kraigen looked directly into the man’s eyes and squared his shoulders in his best, “Wanna piece of me?” stance, the man slackened and stepped back. Kraigen followed reluctantly into a brightly painted kitchen with pink and purple flower curtains. A large, round table laden with salad, milk, steamed vegetables and hot spaghetti sat in the center of the room. Hen tightened his throat to stop his nose from inhaling the aroma of Italian sausage and roasted garlic. Last thing he needed was for his stomach to go growling like some wild animal. Yah, he was hungry. So what? He’d been hungry before, and he’d be hungry again. One hot meal, and a few nights in some Beaver-Cleaver home really wasn’t going to make that much of a difference. It was all temporary, despite their lofty promises. “Here, have a seat.” The man pulled out a chair and patted the cushion. Kraigen glanced at the clock. How long were these charades going to go on? But that was how the game was played. They’d do their part, give him a few hot meals, tell him how special he was, that it wasn’t his fault his mom was sick, like they had any idea what they were talking about. But then he’d mess up, or they’d get tired, whatever, and he’d be shipped off somewhere else. An image of his mother passed out on the vomit-stained carpet, her thick, matted hair spread out across the maroon fibers like clumps of wool, flashed through his mind. He cleared his throat to keep his tears at bay. “Thank you,” and began to push the noodles around his plate with a shiny silver fork. The man with the thick glasses pulled up a chair, sat beside him and nodded for the lady to do the same. Kraigen pretended not to notice the pathetic looks of sympathy that were etched in their middle-class faces. It was like they were watching some mutated cat trying to lap up a pile of spilled milk. Yah, right. You and your pretty little white picket fence and two-car garage? You don’t know And I know you won’t stick around long enough to find out. No one does. 1. What were the circumstances that inspired you to write this piece? My sister has been involved in the foster care system, first as a CPS worker and now as an in-home therapist, for some time, and so her passion for hurting children has bled into me. But also, I went through a period of homelessness as a teen, and a time of feeling unwanted. I carried my belongings--all I really had were clothes--with me in a big trash bag, and so, I've always felt a deep empathy for homeless teenagers and children. But I also know the power of life-changing grace and the hope we, as believers, can offer to America's hurting children. 2. Where can writers look to find subjects that challenge readers--and themselves? I'd say the best way writers can learn about and really write authentically about deep subjects, such as orphan or foster care, is to get involved. Spend time with people. Everyone has a story and a mission. Learn about them, then write about them. When you do, God will open your reader's hearts to healing, their calling, and their unique mission. 3. How does your faith affect your writing? Bonus question: What's the best quick-draw writing advice you've ever received? The best writing advice I've received, the best life advice really, is just get 'er done. So many people say they want to write a novel, some even say it's a driving passion, and yet, many don't regularly devote time to it. Though writing with our muses is great, if we want to make it a career and ministry, we need to learn to write on demand, which means, sometimes we'll have to force our rear ends into the chair and eek those words out, many of which will probably get deleted. Because though writing is a passion, it is also work. We must never forget that; never expect it to be easy. Not to sound cliche', but nothing worthwhile is. As the hurricane forces Jacqueline to evacuate, her need for purpose and restitution propel her north to her estranged and embittered daughter and into the arms of a handsome new friend. However, he’s dealing with a potential conspiracy at work, one that could cost him everything, and Jacqueline isn’t sure if he will be the one she can lean on during the difficult days ahead. Then there are the three orphans to consider, especially Gavin. Must she relinquish her chance at having love again in order to be restored? Read a free, 36-page excerpt here. You can buy a copy on Amazon, Barnes and Noble, or CBD. 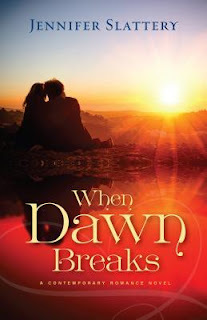 Jennifer is generously giving away a signed copy of When Dawn Breaks. Comment on the post below to enter, and name a novel that challenged you in some way. Mention if you shared on social media to get an extra entry for each share. Hey, Heather! I think this was just written as a blog post, but I'm not absolutely sure! Maybe Jennifer can tell us. It would make a great book, wouldn't it? This lady has serious talent. Natalie, thanks so much for having me! I always love visiting your blog. And I absolutely love your banner image! What a great picture! Waving at you, Jennifer. Great interview! Waving back, my sweet friend! Can't wait until August when I can wave--and hug you--in person! :) Have a great day! Although it is a novel written for middle grades, Pictures of Hollis Woods by Patricia Reilly Giff also gives a glimpse into the mind of a child caught up in the foster system...I read it with my seventh graders every year. "When Dawn Breaks" would be a wonderful addition to the Church Library. Thanks for the review. I love your comment, get'er done Jennifer. That's what I need to say to myself. I am bad about putting things off. Was much better in my younger days tho. I would love to win your book. Thanks natalie for having jennifer visit. Enjoyed your interview, Jennifer, and would love to read "When Dawn Breaks". The story line particularly appeals to me as I took training to become a foster parent, and also worked as a houseparent in a children's home for almost 7 years. It was so gratifying to see many of the children open up to the love shown them, as they learned to trust - they had been abused in so many ways - others were more resistant, my heart ached that they had been damaged so badly. P.S. Forgot to answer the question: I find it hard to name a specific book that has challenged me; I read books for review, as well as for pleasure. I read only Christian books, and choose many whose story lines attract/speak to me - finding inspiration/challenges in so many of them, one of the main reasons I read them. Hi, JENNIFER! Thanks for coming by! CATHY! Great to see you! That sounds like an engrossing story. Hi, JANET! I got your card yesterday (I'm horrible at checking my P.O. Box consistently)! Thank you so much! I've got you entered. Best of luck in the giveaway! DEANNA! I have you entered. Wow, what a cutting-edge book. I'd love to check into that one. Thanks so much for being here! Hey there, MAXIE! Great to see you again, lady! Best wishes in the giveaway! Hi, BONNIE! It's incredible how fiction can touch us so deeply, isn't it? Especially when it resonates with real-life issues and reflects hurting people. Tugs at my heart strings. Thanks for entering the giveaway! And thanks so much for sharing the post!! You're awesome!